About 24 hours ago, Nintendo president Satoru Iwata unveiled something truly amazing about Nintendo’s upcoming game console. It wasn’t the name (they’re calling it the “Nintendo Revolution” for now). It wasn’t the look of the console (it’ll be about the size of three DVD movie cases stacked on top of each other). What he showed, and the thing that is causing all sorts of buzz in the gaming industry right now, was the Revolution’s controller. Leave it to Nintendo to not only innovate, but to be innovative in where they innovate. Most companies are pushing the boundaries of realism in graphics and sound. That’s fine. Personally, I don’t think that will be lastingly satisfying. We’ve been improving graphics since we had graphics, and the changes never really please you beyond the first 30 minutes you see them. But how the player interacts with the game… that hasn’t changed much lately, and when it changes, it changes the very roots of the player’s connection to the characters on the screen. I won’t go into exactly why I think the controller is so cool. If you want to see a two-minute video about it (I know you do), just download it from IGN. You’ll get the idea pretty quickly. The central idea is that the Revolution knows exactly where the wireless controller is, how it’s moving, at what angle it is being held, how it’s being tilted, exactly how far it is from the TV. Everything. If you want to understand the idea a bit more thoroughly, check out IGN’s 19-minute video, including the most important part of Iwata’s keynote. It begins with the same 2 minutes of the video above, so you don’t have to download both. I’m extremely excited. Swashbuckling, gunplay, fishing, conducting… flashlight-wielding? I love it! I have no doubt this is going to be amazingly fun and refreshing. The only concern I have is that developers aren’t creative enough and won’t come up with games that truly utilize all the possibilities. But Nintendo is usually the only developer that fully utilizes their own console, so that’s nothing new. I’m generally pretty excited. I think its a smart move on Ninendo’s part to truly distinguish themselves from MS and Sony. I agree that I have my doubts if 3rd parties will really “get it” but we’ll see. Japanese families are so cute. Especially grandfathers with grandsons as shown in the fishing part of the clip. Too cute. I suppose it distingues Nintendo again, which is a good thing considering they are yet again not the first ones out with a new console. However, my concerns with the controller is that it is “gimmicky.” Nintendo has done this sort of thing before, and while there was some success, there wasn’t much of it (remember the NES robot, etc.?). If they can convince developers to work with them, and actually get people to make games for them beyond the Metroid/Zelda/Mario group, they might do okay. An interesting new controller doesn’t say too much for that, however. 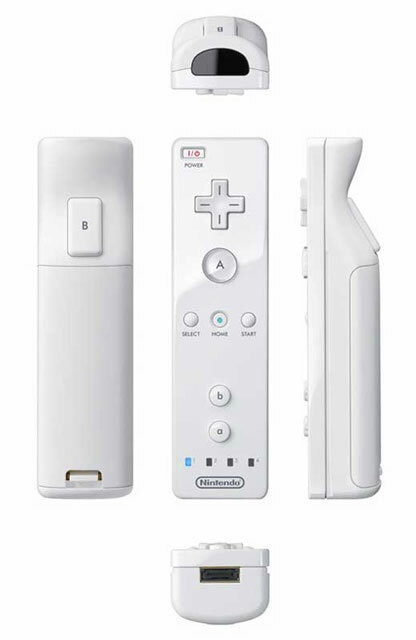 The good news on that front is that Nintendo will be developing an adapter that will allow you to plug the new controller into an old-style two-handed thing with buttons, much like the controllers of today. So technically developers could step around the good stuff and make the same old boring crap. Which they will. 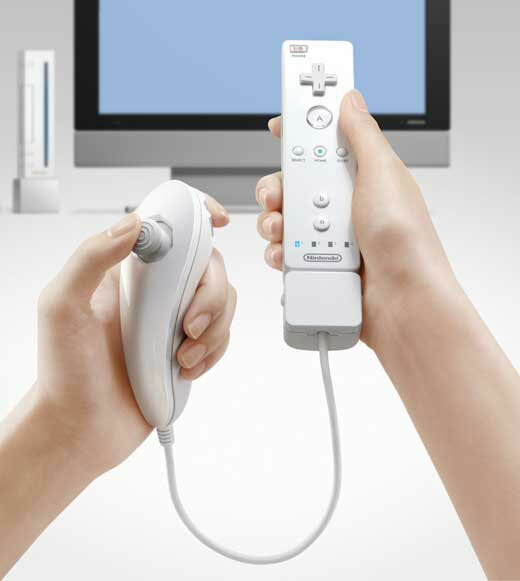 Unfortunately, I’ve never met a Nintendo controller that I liked (wireless capabilities of the wavebird excepted). The N64 controller was obviously a low point, but I don’t exactly have confidence in Nintendo’s ability to design controlers that I like to use. I think this is yet another continuation of our on going disagreement about “inovation for the sake of inovating”. OK, after re-watching the video, I noticed that the controller seems to have a button that can turn the console on and off remotely. If that’s legit, I’m almost willing to forgive the rest. I’m probably biased due to my relatively negative experiences playing games that rely on tracked controlers. For instance, I’ve played a port of Quake 2 to a VR set up, and I actually found it much harder to aim by pointing my hand vs using a mouse and keyboard (which is a pretty tried-and-true FPS control system). It’s possible that the port wasn’t done very well, or that I just needed to get used to it, but I just don’t see the wand as a universal solution to game control across all genres. I wouldn’t be complaining as hard if this was an add-on like the eye toy rather than the primary controller. Sony has had some success with add-ons like the eye toy and the DDR pad, Nintendo has done add-ons like the Donkey Konga drums, and all three current consoles support microphones in some capacity (although I’ve yet to see reports of a game that has usuable voice control). 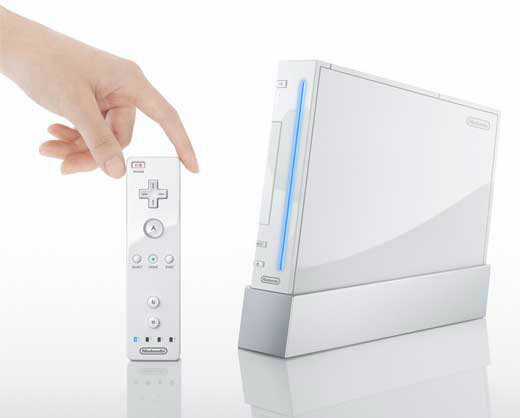 People have pointed out that Nintendo has done controller inovation before (apparently they’ve been the first of the major players to include things like analog sticks, shoulder buttons and rumble packs), but I don’t see why they needed to abandon a functional control scheme in order to introduce some of the features we see on the new controller. I’m with you, Gos. As you said, this would be a cool idea if it was a controller for certain games, but it seems not all that great for the main controller. And really, the thing seems awkward to handle. I’m not at all sure how it will work with an actual game: their commercials make it look good, but how are games actually going to work with this thing? I’m not entirely certain how. They might prove us wrong, but the burden of proof is on them. And given Nintendo’s track record of past years of NOT working with developers, I’m skeptical that they can pull this off. Maybe they will, but I’m not really going to hold my breath. I’d say that keyboard and mouse are much sharper controls for most games than the current controllers, and maybe this will fix that problem. Innovation is nice, but is it practical? Will it work? Can they get developers to work with it and make games? Will audiences buy it? I dunno. It’s all iffy now until I see some great games and actual use of this controller, rather than cute people pointing the thing at a camera.